This premium adjustable shoe stretcher helps make every pair of shoes your most comfortable pair. Whether you suffer from bunions, are prone to getting blisters, or just have wide feet, these shoe adjusters were designed to help you. To adjust the width of your shoes simply place the stretcher inside the shoe and turn the handle to build pressure. The stretcher will start to expand and widen inside of your shoe. Once you have adjusted the shoe stretcher to the desired shape, all you have to do is leave the expanded stretcher in your shoe overnight or for a full 24 hours. The longer you leave the stretcher in your shoe the better results you will see. To adjust the length of your shoe, you will need to adjust the lengthening knob until the block heel of the stretcher extends to the length you need. An additional step you can take to help maximize the comfort of your shoes is to attach one of the four included pressure relief pods. On the top of each shoe stretcher, there are 10 small holes. These holes are carefully placed in the areas most people have concerns with. 100% no hassle satisfaction guarantee! Your feet will thank you! 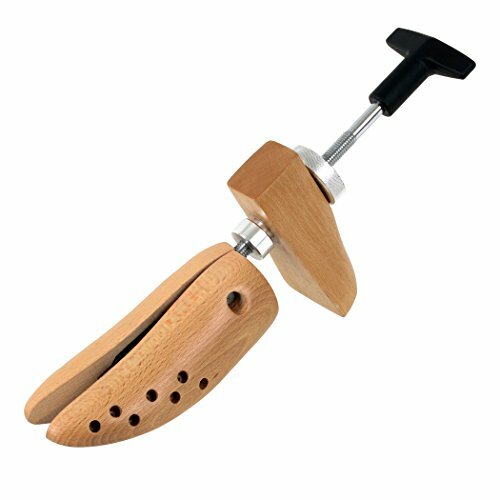 Whether your shoe concern is width, bunions or tightness in the toe or heel, our beech wood shoe stretcher was designed to lengthen and widen shoes that are too tight or uncomfortable. This shoe expander will help prevent painful blisters and calluses caused by shoes that are not properly adjusted to your feet. Each shoe stretcher comes with an easy-grip plastic handle and four pressure relief pods to help those who have bunions or are prone to blisters and corns. Every purchase comes with one shoe stretcher unit and a full one-year warranty that covers any damage or defects. If you have any questions about this product by Plixio, contact us by completing and submitting the form below. If you are looking for a specif part number, please include it with your message.